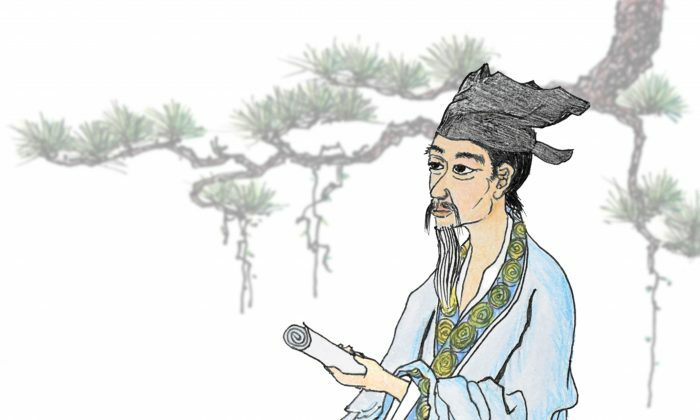 Bai Juyi (772–846), also known as Po Chu-I and by his courtesy name Letian, was a renowned poet of the middle Tang Dynasty and a practitioner of Buddhism in the secular world. One day, someone asked Bai casually where the characters “zhi” and “wu” were, and he pointed out the characters. He was tested many times, and each time, he would point out the characters correctly. Everybody was stunned. Bai remembered the characters even though he was only a baby. In 809, the fourth year of Yuan He, Bai passed the Jinshi Imperial Exams. There were two schools in the literary world at that time—one led by Han Yu, and the other by Bai. The former promoted old prose, while the latter worked on poetry. Bai said the sage could bring peace to the world because they could touch a person’s heart; and to touch a person’s heart, one must be concerned about the people and their problems. Whenever he spoke to someone, he would find out from the person his views on current affairs and social issues. Every time he read a book, he would want to learn philosophies on life. Bai was not calling for a pretentious artistic style, but the composition of didactic poems to expose social injustice and reflect the people’s feelings. His simple verses and unaffected personality provided an outlet for the people’s grievances. Poetry became popular, and the purpose of reflecting the political and social situations was served. When he and Chen Hong visited Maweipo, the place where Emperor Xuanzong of Tang (Li Longji) had ordered Imperial Consort Yang to hang herself, Chen Hong produced the novel known as the “Legend of Unending Sorrow,” while Bai wrote the “Song of Unending Sorrow” in one go. This poem about Emperor Xuanzong and Imperial Consort Yang created a sensation at that time. When Bai traveled from Chang’an to Jiangsi, which was about 3,000 to 4,000 li (about 1,500 to 2,000 km) away, he saw that his poems could be seen everywhere—at rural schools, monasteries, inns, and piers. Everyone, including the nobles, monks, priests, and old and young women, could recite a few of his poems. Bai Juyi became a trend and a brand name that was highly sought after. When the nobles and influential people heard the “Songs from Qin” written by Bai, they changed color. The emperor also got upset when he heard it. Generals gnashed their teeth in rage when they read “One Night in the Village Below Purple Pavilion.” All that was because Bai was able to voice concerns about the present situation and relate to the people. Bai revered gods and deities and practiced Buddhism. He spent his twilight years in Xiangshan Monastery of Luoyang and gave himself the literary name Xiangshan Jushi. He helped with the donation to build Xiangshan Monastery and compiled the 800 poems he wrote during the 12 years he spent at Luoyang into Bai’s Luoyang Collection. The set of books is kept at the library of Xiangshan Monastery. Every time he fell sick, he would do paintings of Buddha. He saw everything that happened to him as being the result of karma. When he met with a setback, fell sick, or was demoted, he was calm and collected. In “Two Poems Full of Lament and Sorrow,” he pointed out that all sufferings in life were the results of one’s own actions. Bai worshipped Buddhas, especially Maitreya. His vow said it all. In 816, the ninth year of Dahe, 63-year-old Bai fasted together with 60 people including Monk Dao Song and Hui Gong, and over 80 followers, and prayed to be born into Maitreya’s paradise in their next lives. Through his practice of Buddhism, Bai acquired the supernormal ability of precognition and retrocognition, which is the ability to tell a person’s future and past. He wrote in the poem ‘Self-Explanation’ that Fang Xuanling* was a Zen monk in his last life, and Wang Wei* was a painter. When Bai went into meditation, he saw that he was a poet in many of his previous lives. That was why he was able to display his talent in poetry in this life. His personal experience showed that a person’s aptitude has everything to do with his last life. Being a practitioner made him take death in his own stride. He felt that no man could escape old age, sickness, and death, even if there were a panacea or magic formula; and the only way to escape the torture of sickness and reincarnation is to practice Buddhism. Bai was a steadfast practitioner, and his sickness did not bother him. He also made the vow to practice Buddhism when Maitreya came to this world, and be the first to Zhuan Fa Lun (turn the Law Wheel). Before he breathed his last, he indicated his wish to turn his residence into a monastery. Touched by his virtues, Emperor Xuānzong of Tang (Li Yi) promoted his brother Bai Minzhong to become prime minister. The refined and amiable poet who led the generation of his times was a legend. He made a vow one thousand years ago to follow Maitreya to the mortal world to practice Buddhism. * Fang Xuanling was a writer who served as chancellor under Emperor Taizong in the early Tang Dynasty. * Wang Wei was a poet, painter, musician, and statesman in the Tang Dynasty.